In a December 2006 interview with Congressional Quarterly, Reyes said that al-Qaeda, an exclusively Sunni group, was composed of "both" Sunni and Shi'te members. He then instead asserted al-Qaeda is "predominantly probably Shi'ite." He also avoided answering the question whether Hezbollah, a Shi'ite organization, was Sunni or Shi'ite. Alec Smart Said : "This is kind of scary. 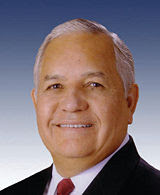 The head of the House intelligence committee, Congressman Silvestre Reyes, failed a quiz on terrorist organizations. He didn't know the difference between a Sunni and a Shiite, didn't seem to know what Hezbollah was. So , I guess the term 'intelligence committee' is just a suggestion for us."